One of the best ways in which you can let other people know what you are and what your achievements in life are by developing a personal website design. Personal website designs are gaining popularity these days. Designers tend to be unique and wanted to stand out of the rest when they develop their own portfolio websites. By this way, they are able to showcase their skills and talent to their future employers. 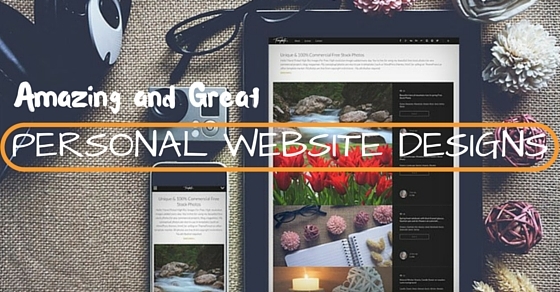 In order to promote yourself, all you need is a personal portfolio website. Let’s glimpse through a few amazing personal website designs. Is a designer and website developer who has developed one-line portals and complete online super store. The best part about him is that he is always passionate about developing a good user experience. Apart from all these he is also a technology enthusiast and loves to learn new things. Melanie Daveid is an art director UX designer who holds a simple but awesome portfolio. The best part of the website design is that the intricate presents a number of logo opens and closes along with an infinite scroll design which brings her resume to presence on your screen. She has mentioned in her portfolio that art work and illustrations was her gateway for blooming into the creative industry. By this way she directed herself into her own studio and stepped into first steps of digital world. This is yet another amazing personal website which has an evolving site. Every time any user uses it and comes back again something new would have been added to the awesome site. The creation of Dundy Punk website is a beautiful intricate portfolio being presented with alter-ego and online presence. This feature is mirrored in the site with relevant characters. The best part of the site is that it reflects the quality content presence. Alexey Abramov is a Moscow based graphic designer who is associated with a number of clients all over the world. His work is made extraordinary and appealing as it is developed with great attention to minute details, animated typography and complimentary palette along with clarity communication. There is never a need to include state of the art designs, animation, or even a self-portrait. Minimalism is important in website designs as they are simple than a handshake. In this personal website wade mentions about him without messing around. His website is made outstanding and unique because he gets to the point without beating around the bush. Readers are able to get to the job goals and objectives before the page is loaded. Michela Chiucini is a Tuscany based website designer and lives in Viareggio. The highest of her designs is that they employ usage of latest creative technologies where her main intention is to satisfy user experience. The little green world of Sean Halpin is a website which must be glanced through because it is a perfect example which shows you how to build your perfect website. The best part of Sean Halpin website is that it is simple and also easy to read, also the website presents the skills and talent for stand-out and a bold design. A developer and designer Jon White Studio loves clicking, tapping, hovering, interfaces and more. He thinks a lot about the end users device and mainly concentrates on the elasticity and semantics. The browser, its history and elasticity are few aspects he likes the most about the website. This website was considered one of the most creative website. The website was made in a very original and exceptional manner which grabbed others attention. The website was made in google search engine style and looked exactly like google. This enthusiast Timothy Van Sas is a front end developer who currently works for concept7. Semantic web and web standards are the areas where this individual has interest for. This individual has the capability to develop interesting codes for websites. The website developed with unique code and design would always be pleasing for the user’s eyes. The main specialty of Timothy Van Sas is that he develops slick and neat designs along with maintainable codes. The amazing features which are utilized by Juliana Rotich for development of their websites are black and white colors and she makes the website neat with simplicity. She maintains a fix-positioned menu which always wanted to stay before the eyes of the readers. Moreover there is also plenty of information available about the owner’s goings-on. This is just a hint and there is lot more to be read about Juliana’s website. The brads are famed and are weekly available about Brad Colbow and Brad Dielman. These two are famed website designers who are present in Cleveland, Ohio. The RSS feed can be the right way in order to keep updated with the weekly feeds. He utilized most of his time designing killer user interfaces. He utilized real life front end development ninja with the same name. With the assistance of apple products and web standards he was made a great designer rather than being pushed down. The attracting site was because it had a cool bluish background similar to movies. The menu in the site has a fixed position and is positioned on the right sidebar of the web page. The best part of the menu is that it is a pretty interactive one. Designer Ricky down is a specialist in development and web design where he creates dynamic websites. The websites developed by Ricky are valid CSS & HTML ones which makes use of industry standard programs such as flash, dream weaver and Adobe Photoshop. Tim Van Damme has a number of reasons for his personal website to work perfectly. Being one of the effective online portfolios, the website features a self-portrait of the candidate itself. By developing such sites it is believed to be honest, genuine, and also makes the readers believe that they have met you and urges them to do so. The best part to be spoken about Pushkar Modi’s site is that his landing page mixes easiness with a simple icon. When navigated through his website and clicked on the about me section of the site, the features and work examples aren’t overdone but perfect. By glimpsing his website the readers would get to know that there are a number of projects for him which is not done too much. Flashy designers aren’t required in order to develop these sites, what they need is easy to view and a demonstration about yourself. Living in Buenos Aires, Argentina, Julian Andrade is a filmmaker. This individual has worked in Central America, Argentina, Brazil and is an advertising director and producer. Julian has worked with various agencies such as DDB, BBDO, Leo Burnett, Ogilvy, TBWA, and lot more. This individual has shot for a number of brands such as Dogui, sprite, Brahma, Claro, Pantene, and for many mass consumption companies such as Procter & Gamble and Unilever. The highlight with Quincy kools website is that the categories that deliver personalities are clean without any mess. The about section is also very human in Quincy’s website. Once the about section is read and Quincy’s projects and photos are read, then they are felt very effective rather than sending mails to him. The 24 year old electric guitarist Allison Weiss who is an avid which has whole lot of feelings and emotions that follows him. The website is uploaded with three minute pop songs which make the sight fun and interesting. The sharp pop sensibilities and quirky charm are few highlights of Allison’s website. Nathan’s portfolio is one of the most styled one when compared to others. This is because Nathan is an individual who is more passionate about brand and design. The website layout is so perfect that it makes it easy to contact the candidate and click through his portfolio which is more inclusive with click ready icons on the landing page. The projects in the website are highlighted with the help of user-friendly scroll down template. The best and neat way in his project is that he has skipped the introduction and has directed directly to his works section. Being a designer Daniel does pretty things in his design. The specialty of the site is that he makes use of images in order to make structures for the site. The page is also made delicate by the usage of font size and logo. The accessible website makes it easy to contact Ashley with the button called “let’s work together” on the page. There is no need for emailing, scrolling or searching and is made easy for communication. In the same manner work is also set up in the same manner where there is no need to scroll down to see work or share down any post. Maurice mainly uses design as the main parameter in his website. When navigating through his website, it makes the user a pretty fun place to work with interactivity. Splash pages are ones that are found with the portfolio page though there are two other designs. The creative portfolio of Maurice tells a story instead of directly getting to the point. The appealing aspect of the site is that it has a beautiful blurred background and number of images pop out as the page is being scrolled over. Site by Alistair stands to be a very ordered and classy one. When the user hovers over the image, accurate contrast is obtained. Being a free-lance designer, Mike is a Canadian who serves web developer, design studios, ad agencies and many more worldwide. Being a hard worker he makes his site awesome with his skills and abilities. Jeff is one of the partners of Go media, where the websites owns CG animation and background illustrations. Jeff also has interest for social media, marketing and development of communities around brands. Foxie is a graphic designer since 1998, where before this he has been for a number of quality companies. From 2004 he has mentioned himself as a freelancer art designer and director and working till date. The best part of Sam Mearns website is that his portfolio is showcased with a neat and simple design. There is no clutter and hence most readers would go for it. Robby’s is a video game design which cannot be developed by all designers. The development is made interesting and is a cool website. Nina was hunting for a job in Airbnb and hence developed a portfolio dedicated for the same. There was good response and her site was focused, she also later got an interview. Matteo’s site is a simple and cool website which has a number of features in it. The interesting fact is that there is some kind of magic in the website too. This individual makes extraordinary designs where he also possesses some kind of Goofy illustrations that takes place. The site developed by Alexander is perfect and tidy. It is a good example for an online resume website. These are few amazing personal website designs available. There are many other websites also available which can be glimpsed through. Every personal website has its own unique features and design which can be glimpsed through for a perfect experience. Every site is different and unique which has varied interesting facts too, individuals who desire to develop their own website or portfolio can run through these personal websites in order to have a good idea. Top 28 Companies That Use Child Labor Still ! Selling Body Parts – How To Sell Your Body For Cash?